I’ve been studying Parelli Natural Horsemanship for a few years and never before took the time to get “officially certified” in the program. I’ve signed up for a level 3 & 4 clinic in June which means I must be certified in level 2 to attend. 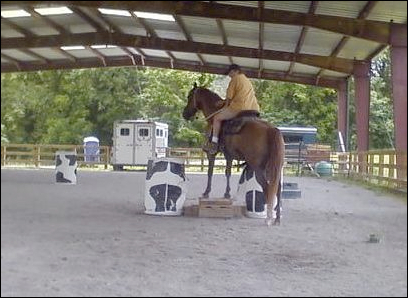 I’m really looking forward to the clinic which is with one of Parelli’s top trainers, Carol Coppinger. 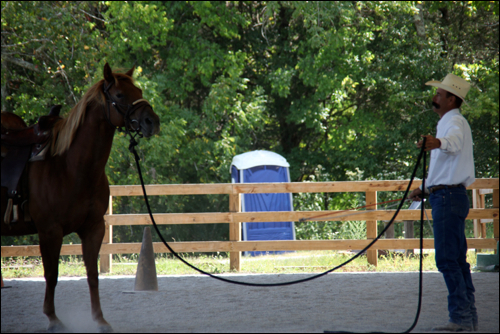 I’ve been to one of her level 1 clinics a few years ago and she’s amazing. Great teacher too. He was born here and is out of my quarter horse mare April. She died last year at 24 from a spine injury suffered in a fall last winter. She slipped in the pasture when it was wet and muddy. She was a great horse, my best friend and a wonderful mamma. I still miss her and the many trail rides we had together. She is buried on our farm down near “the point,” a spot next to the geldings pasture and the lake. In terms Parelli folks understand, he is a left brain introvert/extrovert (I see both of those in him so not sure where he falls on the chart) I started riding him before winter set in and now we’re just getting back to riding in the arena. He’s been doing really well and I think all the ground work is really paying off. He’s side passing, coming off my leg, picking up his lead and backing nicely. I’m really happy with his progress. He has a full brother “Grayson Chex Leo” that I am working with too but I am not as far along yet with him. I’ll post more about him later. A local trainer, JR has been coming to the farm to help start all the young green horses and he’s really helped me with my riding skills too. 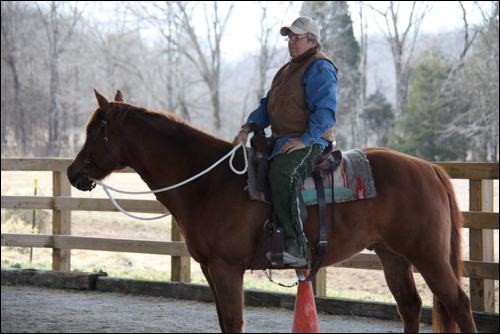 He’s the 3rd generation in his family to train horses and he too is a natural horseman. Here he is playing a circle game with Dolly (“Honcho’s Dolly Dee”) another one of our quarter horses in training at Avalon Farms. I spoke with Janis Sontany and she really needs help to get HB3386 passed. The agriculture committee for the most part is not wanting to deal with this. They are going to need to hear from us or they are going to basically blow it off. Please call the people on the committee and tell them how you feel. Is it ok to look the other way while horses and other livestock are allowed to starve? We protect dogs & cats but not horses? Tell them how you feel. If you know members of the press ask them to come Tuesday, March 16th at 9am on Capitol Hill Room 28. If you can, show up yourself. I’m going and so are other horse enthusiasts and people who care enough to speak for these animals that cannot speak for themselves. I grew up learning that Tennessee was not only home to “Music City” but that it was “horse country” as well. Growing up in New England, I read about it in school text books and saw pictures of rolling grass pastures full of horses. That’s one of the reasons I moved here. As a musician/songwriter and an equestrian, music and horses are two huge interests of mine and Middle Tennessee offered both. My partner & I purchased a horse farm in 1998 and there are currently 15 horses under my care here at Avalon Farms. Now, a bill is being introduced to the agriculture committee (HB3386) to make it a felony to starve these and other farm animals. Rep. Janis Sontany is introducing it after witnessing for herself, the 84 starved horses from Cannon County in November. She came down to the fairgrounds where many of us were volunteering to feed them and care for them under the supervision of the National Humane Society. I held horses for the farriers that voluteered their time to trim feet. I saw hooves with frogs completely rotted away from standing in their own excrement. I saw feet with shoes that had been left on for months and growth so long that they could barely walk. I saw many horses so underweight that from my own experience I know it would take a year or more to bring them back to a healthy condition if they survived at all. Pass this along to everyone you know. The Humane Society of the United States invites you to participate in the Tennessee Humane Lobby Day at the Tennessee State Capitol Building where you’ll meet directly with your elected officials about legislation that will significantly impact animals. Before Thanksgiving, you will recall the 85 horses and mules removed from a farm in Cannon County. It was obvious that these horses were in very bad shape – many hundreds of pounds below normal weight. The horses were relocated to the Nashville Fairgrounds and cared for by volunteers from all over the state, many from Nashville and Middle Tennessee. At that time, I committed to filing a bill that would make the intentional withholding of food and/or water from any animal a felony. Currently, withholding food and/or water from companion animals is felony aggravated animal cruelty – to do the very same to “livestock” is a misdemeanor. It makes no sense to have one penalty for companion animals and a different one for “livestock”. Cruelty is cruelty regardless if you are 3 lbs. or 16 hands high. Sen. Ketron and I have sponsored legislation that will make withholding food and/or water from ANY animal felony aggravated animal cruelty. The bill numbers are HB3386 and SB3546. The bill can be viewed by going to http://www.capitol.tn.gov, the legislative page will appear, go to the bottom left hand side to “find legislation”, enter the bill number and click on search. You can print the bill from there. If you have problems, please call our office at 741-6861. Please contact your legislators – both House and Senate – and ask for their support in passing this important legislation. It will take everyone working together. I spend today at the fairgrounds in isle D taking care of the horses on our row with Scott & Cynthia. My job was holding horses while Scott shoveled poop and grooming. The horses are looking a little better and most seem to be doing well. Most have had feet trimmed, wounds treated, manes and tails combed out and are enjoying a steady diet of fresh hay and feed. JR came today to work with the stallion that nobody could handle. It would bite or strike and had a nasty wound on the front leg that needed to be tended to. JR put a grazing muzzle on him to at least eliminate the chance of a bite and was able to walk him outside for a soaking with the water hose. Two volunteers cleaned his stall while he was out in the parking lot area. Most of the horses are very sweet and easy to handle. I think they know we are trying to help them. Life has certainly changed for them. They are out of the weather and even have a blanket when the temperature drops again tomorrow night to 22 degrees. The shavings in their stall are fresh & clean and 4″ deep. Every stall has fresh hay and a salt block along with a bucket of fresh water. Volunteers are brushing and grooming them back to a soft fur coat instead of the mud caked crusted mess they came in with. As the days go by, some of the volunteers may drop off so contact tnhorserescue@hsus.org or go to the fairgrounds to sign up. They have an office in a small trailer next to the barn. The response has been wonderful. I’ve seen farriers I know, JR who comes to Avalon Farms twice a week to train our horses has been going down there and several friends I know have been down there helping. I’ve met a lot of horse lovers from all around middle Tennessee. There are also folks from out of state there too. Eventually these horses are going to be up for adoption. Some will be fine mounts when they put on weight and gain back their strength. Some will be too debilitated for riding but will need that special loving person that wants an equine friend. Some are young enough that all this will be a dim memory from when they were are baby. I hope they all find good homes and have a happy life. I’m not sure what the process will be but the humane society can tell you. They aren’t ready for that and won’t be for a while. The law isn’t good enough to protect horses in Tennessee and there are wheels in motion to change that. I think that is one good thing that will come out of all this. I’ll post the proposed bill as soon as I find it online. I think it’s so cool that so many people have come together to save these animals. Hi Val. We are good on feed thanks to Tractor Supply. Right now, taking care of our volunteers with food, soda, water, etc. is our biggest need. If anyone has contacts with restaurants, grocery stores etc let me know. Thanks. It took one individual to do so much harm to so many horses. I over heard one woman say she looked at one of the horses from behind and at first thought she was looking at a cow. The hip bones and sunken hind quarters are so pronounced in so many of them I can understand how she could think that. I spent the morning holding (and calming) horses so the ferrier could trim the feet and remove shoes on some. The untreated thrush was so bad that one didn’t have any frog left. Live tissue was all that was left. The toes had grown over and were touching the heels. Standing in manure so long it had dried on the outside of the hooves and when he was finished we realized that some had white hooves instead of the dark brown we saw when he started. My wonderful trainer JR was there too calming a stallion that nobody could handle. He was able to walk him out of his stall so others could clean it and he was desensitizing it so a leg wound could be treated. When I left this afternoon it was standing quietly by his side while several humane society women showered it with love and petting. Mary Ann and your sis, thanks for coming out to walk some of the ones that needed exercising. I know your life is busy and your own horses need your time. Josh, Jay and Jim and all the ferriers that came out today and other days to trim. It’s hard work any day but to do horses that haven’t been handled, don’t have a reason to trust people and have some of the worst cases of neglect. You guys are angels. The humane society has been so great at organizing and providing information, tools to do the work and food for the workers too. I’m sure they are doing a ton behind the scenes to encourage people and companies to step up and make the donations needs to keep the operation going. Feed and hay is stacking up in the surrounding barns. Tractor Supply has made a big donation of feed and shavings. I’m sure some of the tack must have come from them too but I don’t know. I just know its brand new. I heard that a woman donated $6500 and when I was leaving there was an impromptu fire bucket drill tossing box after box of brand new blankets to cover them tonight. The tempeture is dropping down to 25 degrees. Thanks too to the local tav guy from channel 5 shooting video and covering the story. This afternoon the humane society brought in a bunch of dogs that were seized in east Tennessee. Tennessee has some serious problems with the treatment of its animals. We have problems with the law and how to punish those that abuse like this. My hope is that when this is all over what will come out of it is a law that makes it a felony to starve any animal and education for young people growing up to learn how to care for other living things.